Thank u my dear friends 4 supporting me in this sweet journey. Bhavya looked at Raghu in the railway station. She thought:Finally my confusion is clear.Rudraji is not there in my destiny.My soul mate is Raghuji.That’s why God make me see his face through the sieve. She smiled looking at Raghu. He thought:Finally Rudra is out.My route is clear.I hope Bhavyas heart is not wounded because of what happened today.I can’t see her in pain.I want to heal her wounds with my love.I hope Bhavya will fall in love with me one day. 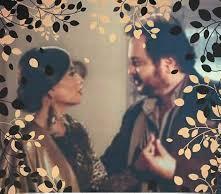 The Oberois reached the Oberoi Mansion with Soumya. Rudra:This is our house Soumya. Harish:Now let us make preparations for Rudy and Soumya’s wedding. Shivay:Wow..finally our Rudy going to get married. Anika:We will have rocking dance and music. Ahem:I will contact wedding planners. Gopi: Catering will be my section. Rudra:This is your temporary room.Very soon you will shift to my room. He took out a ring and slipped onto her finger. Rudra:Finally I myself put ring on your finger..that also on the right finger. She smiled:It was my dream. While walking the wind blew and Romi’s duppatta got stuck onto Samir’s shirt. He moved closer to her.They shared a beautiful eye lock unknowingly. Samir:Romi..when I look at your eyes I feel something else. Samir:I think I am falling in love with you. Romi:If you love me,keep loving me. Romi:You know ..I saw you first when you arrived home with Prem bhaiyya.That time itself I fell for you.I am not mad to fast for an unknown person on Karwachauth.On karwachauth I fasted for you only. So purposefully I pretended to faint before you so that you will break my fast. Samir could not believe it:Really? Suddenly they saw Tej,Jhanvi,Sujata,Rajendra,Nirmala watching them. Rajendra:Tej…we wanted us to be relatives.We wanted my son to marry your daughter.We can still fulfill our wish. Sujata:God has given one more opportunity to fulfill our wish. Tej smiled:Yes…my daughter Romi is for your son Samir. They smiled at Samir Romi.They were surprised and happy. Pehla khumaar(Jo Jeeta Wohi Sikandar). Raghu came with his parents. Rajendra and Sujatha welcomed them. His father Sajjan Singh said:I came here to ask your daughter Bhavya’s hand for my son Raghu. His mother Sumitra:Raghu loves Bhavya a lot. Rajendra:Once we did a mistake by fixing our son Prem’s wedding without asking him.This time we don’t want to do it.We want to ask Bhavya before fixing the marriage. Raghu:Yes uncleji.I also want to marry Bhavya only if she likes me. Prem:Don’t worry Raghu.You are perfect.Bhavya will surely like you. Bhavya blushed:It’s yes from my side if you all are happy with this alliance. Raghu and others were very happy. Raghu and Bhavya were sent to a room to talk. Raghu:You are really happy with this alliance? Bhavya:Yes.You doubt because of what I told you about Rudraji’s alliance.Right? Bhavya:That was my stupidity.after all I am foolish.But on Karwachauth I realized that you are the one Rabji made for me.But I was confused. Bhavya:You know that day after worshipping moon I saw you only.If you were not my soul mate why would God show you to me? Bhavya:Ya.But do you love me? Raghu:Yes.I have been loving you since childhood. Bhavya couldnt believe it:Since childhood?Then why did’nt you tell me? Raghu:But I had no guts to confess it you. Raghu was shy:I ..I love you. Bhavya became shy:I love you too ji..
Soumya was sitting in her room with a weeping face. Rudra sat near her:Soumya..now we are together.Our wedding is also near.Then why are you upset? Soumya:Rudy…I miss my parents and Romi.I want them near me when I get married to you. Rudra felt sad seeing her tears. Rudra:Soumya…we are getting married with their permission.Do you think they will let the wedding happen without in their absence?They will surely reach here soon. Soumya’s face blossomed:I can’t wait. Shivay came:Come..there is a surprise. Rudra and Soumya went to the drawing room.They were surprised to see Tej,Jhanvi and Romi there. Soumya ran towards them.They hugged each other. Jhanvi:Don’t worry.Now we are back. Tej:There is one more surprise.Not only us,Rajendra and family…then Prem’s friend Raghu and family also have come to London.Guess why?Prem and Simar will get married here.Prem’s friend Raghu and Bhavya too are getting married. 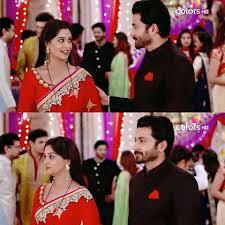 Soumya and Rudra were surprised. 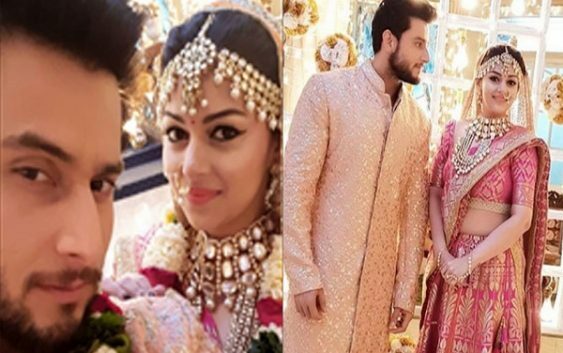 Jhanvi:There is one more wedding happening.Guess whose? 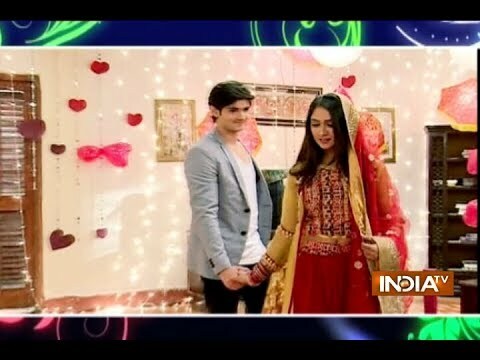 Jhanvi:Our Romi too doing love marriage with Samir. Soumya was surprised:Romi..Samir and you? Soumya:You hid it from us intelligently. Romi:Now only our love story started di. Soumya smiled:Oh..But I am very happy for you. Soumya and Romi hugged each other. Rudra looked at Tej.Tej smiled. Rudra:I am fine.How are you uncleji? Tej:My daughters are getting married to their love.What can make me more happier? Rudra:I want to confess you something. Everyone looked at them curiously. Rudra reminded him of the incident in the restaurant regarding liquor. Rudra:It’s me.I am the one who argued with you.That’s why you found my face familiar. Soumya and others were tensed about Tej’s reaction. Soumya thought:Everything was fine.But now what will happen? Shivay thought:What was the need for Rudy for confessing it now when Tej Uncle does’nt remember it?He is spoiling everything.How difficult was to build up everything.But he destroyed everything. Rudra:I don’t want to hide anything as I am going to start a new life with you all.I am really sorry for everything.Please forgive me for my stupid childishness. Tej smiled:It’s ok.That stupid mistake is nothing in front of the good things you did. Soumya,Simar,Romi and Bhavya had their Mehendi ceremony. Nach Di Kudi Nu Chak De… (8)(TUMKO NA BHOOL PAAYENGE). Shivay and Anika hugged Rudra and Soumya in happiness. Bas ek tum ho(1942 LOVE STORY). Apni jaan tere naam karta hai( Jaan Tere Naam). They all got ready for the haldi function. 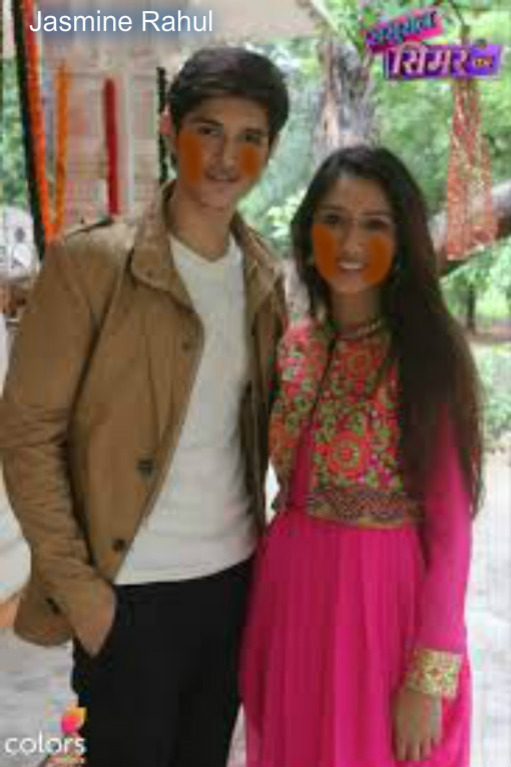 They all had haldi function too. got married in a grand manner. I took my bride with me. She blushed:Our love won and we got married. Rudra:In big places such small things happen. 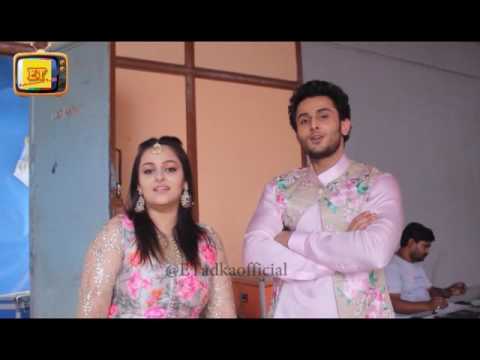 The post Dilwale Dulhania Le Jayenge RuMya SS Part 14 (Ending) appeared first on Telly Updates.